Built in Dumbarton in 1869, the Cutty Sark weighs 963 tonnes, has a 152-foot main mast and boasted a top speed of 17 knots. This famous clipper made record-breaking voyages bringing tea from China and wool from Australia back to Britain. The ship’s name – and the inspir­ation for its figurehead – comes from a Scottish legend, retold by Robert Burns, of Tam O’Shanter’s admir­ation for a graceful young witch who wore a ‘cutty sark’, the dialect term for a short chemise. In 1895 the clipper was renamed the Ferreira and trans­ported goods between Portugal and its empire until 1922, when it was bought by Wilfred Dowman, a retired windjammer skipper. 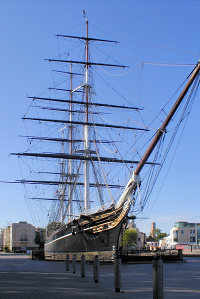 Dowman restored the Cutty Sark’s original appearance – and its name – and put it into service as a naval cadet training vessel. After featuring as a showpiece at the Festival of Britain, the ship was preserved for posterity by the Cutty Sark Society, under the patronage of Prince Philip, Duke of Edinburgh. 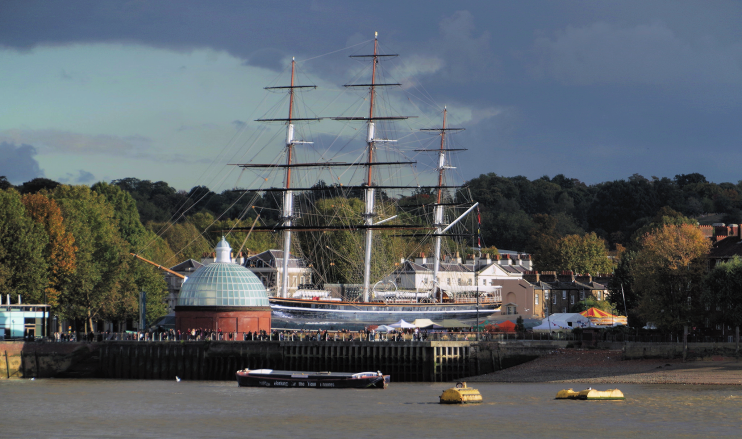 The Cutty Sark was brought to Greenwich in 1954 and opened to the public three years later by Her Majesty the Queen. Cutty Sark station opened on the Docklands Light Railway in 1999. The original plan for the DLR extension to Lewisham did not include a station here, but its potential convenience for tourists prompted key local insti­tu­tions to help fund the construction costs. In 2006 the ship was deemed to be ‘struc­turally in danger’ and the attraction was closed to permit extensive conser­vation work to be done. A year into this project a fire broke out on board, caused by an indus­trial vacuum cleaner that had been left switched on for two days. The ship’s masts, saloon and deckhouses had been removed and put into storage before the fire but repairing the damage never­theless added consid­erable time and cost to the restor­ation programme. Reopened in May 2012 – with the Queen again doing the honours – the Cutty Sark has been raised about eight feet higher than shown in the pre-fire photo­graph above, supported by canted steel props that are enclosed in a glass surround resem­bling a crystal cushion. The project cost £50 million and it is hoped that no further large-scale preser­vation work will be needed for another 50 years. Fundraising for the next phase has already begun. Because the vessel has been lifted up, visitors can walk beneath the Cutty Sark as well as go on board, stroll the decks and learn about its history in the museum, which now boasts the oblig­atory ‘inter­active features’. Some critics were not impressed by aspects of the restor­ation, with the director of the Victorian Society claiming that it panders to the “corporate hospit­ality market” and Building Design awarding it the (derog­atory) Carbuncle Cup, complaining that “from street level, the once thrilling lines of the ship’s stern and prow have now been obscured behind the new glass enclosure.” Nevertheless, in the first year after reopening, custodians Royal Museums Greenwich reported that more than 350,000 visitors had toured the attraction, a 150 per cent increase on pre-closure attend­ances. The title of this article is taken from Robert Burns’s poem, ‘Tam o’ Shanter’. The Alexandria Burns Club website has the poem in full and a translation. * The picture of the Cutty Sark at the bottom of the article is slightly modified from an original photograph, copyright Matt Buck, at Flickr, made available under the Attribution-ShareAlike 2.0 Generic licence. Any subsequent reuse is hereby freely permitted under the terms of that licence.